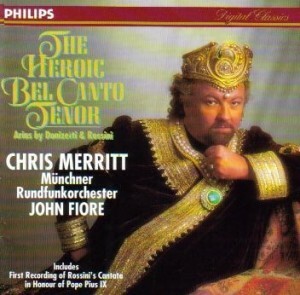 Chris Merritt was singing major roles at the Met, Covent Garden, La Scala and Vienna in the 1990s. Then he hit mid-career and things went wrong. Here’s his story. It could be any of us. Dear Ones, near and far…..I am turning to this entrepreneurial undertaking as a way to finance my career back into functionality. Due to very unfortunate managerial problems, my career has experienced a terrible downslide to the point of almost non-existence. Because of this, I have been forced to completely deplete all existing savings and retirement, causing me to practically live on fumes. Needless to say….I am now without management. In addition, my bank of 19 years….DeutscheBank….refuses to give me any help to get my business back on track, something that I feel they would be happy to offer to other self-employed business people….just not to me perhaps because my business happens to be Opera. However, in the midst of this personal chaos, I have been able to slowly find work on my own, almost at the same time I was thrown out of my management company. Now, things are beginning to look very good, indeed. I have engagements coming up very quickly in Italy, Mexico and the U.S. Other projects are beginning to appear on the horizon. My career is showing signs of life, again. And now, at the point where I am about to embark on these new engagements….I am without the funds to support myself with basics like travel, lodgings and food nor to be able to keep the home-fires glowing in paying regular monthly costs of phone, internet, water, health insurance, etc. For these reasons….I need your help to get my career and my life back into *the black*. If you can possibly help me with this, I would be forever grateful. And the artist and performer in me can feel the glow of expression and involvement once more! Chris is halfway towads raising 20,000 Euros to get him back on stage. To help Chris, please click here. This is not a very elegant way to end a career that actually ended at the right moment. The sad reality is, opera houses book several years in advance, and you can’t argue with a house’s decision not to cast a 65-year old tenor. Let’s hope things end well for Mr Merritt, but it delusional to think that the career will get back on the same track it had previously been on. What difference does it make that he is 65 years old? Your comment is so ageist! Can he still sing? That is the pertinent question. May, you will someday get old, too. I think what this says to everyone who embarks on a singing career is – prepare for the future and have at least one more string to your bow. None of us can guarantee to be earning from our singing voice through to 65 and even the starriest of careers can be relatively short lived. I don’t get it, these “very unfortunate managerial problems”, what are they exactly that it made him impossible (!) to have some savings left or start doing some other job or teaching? Sounds a little bit strange to me…. I also find it strange that managerial problems are cited but no further explanation given. Mr Merritt had a major career that seemed to come to a premature – if temporary – end. Others have been in similar positions. One thinks of Barbara Bonney who appeared regularly on the world’s major opera stages and who took time off following much publicised personal circumstances, including managerial issues. But she has continued to sing recitals and teach. I do find it strange that “managerial problems” should result in such major losses to career and savings! Well the thing is that he does have upcoming engagements, according to this article. He apparently does not have any credit cards, savings, or other means of financing his trips. At minimum, his employers should be paying his travel, and he should get an advance from wherever he is singing to finance his hotel. In any event, I wish him well. He is not the only successful singer I know of who made absolutely no plans or preparations for retirement. I am obsessed with it, even though I am currently mid-career and am still working very actively. But I can see the end approaching, afar off, and at minimum I will have a paid-for residence and car, a resume and degree in a non-musical field, and some modest savings to get me through. Even if Chris’s crowdfund is successful, he needs to think about this as well. I hope he would continue to sing if only to repeat his moving and vocally accomplished portrayal of Mendel in Zeisl’s Hiob, as heard last year in Munich, to a wider audience. Luckily for Chris, the opera houses do not share your opinion that 65 is over the hill for a singer. Some singers are and some aren’t but obviously he isn’t or they wouldn’t have given him future contracts. I doubt he is going to be singing the romantic leads anymore but that is irrelevant. As to whether or not he should resort to crowned funding, that is another matter but I admire his hutzpah. This is sad reading. Presumably things are better now a year later. I remember Mr. Meritt as a first class bel canto singer in the generation of Ramey, Valentini-Terrani, Studer, Matteuzi and several others. How has Chris Merritt’s operatic career been progressing since his successful (I hope!) request for financial support a year or so ago? What roles and opera houses is he scheduled for in forthcoming months? I hope his career hasn’t come to an end!